Wolves were 2-0 up with 11 minutes to go, but Watford turned it around to book a final place alongside Manchester City. Watford striker Troy Deeney, speaking to BT Sport about his penalty: "I just told myself to calm down. I've been practicing penalties for years but with this emotion you can't really recreate the training pitch. So I took myself away, calmed down and got myself back in that training pitch mode. I thought he (Ruddy) was going to stand so I just hit it as hard as I could. "There is no ceiling on this squad. These young boys coming up and keeping me on my toes. If anybody is watching I'd like a new deal thanks very much." Amokachi brought himself on! So the story goes anyway. James, Glasgow: Didi Hamann coming on at half-time in the 2005 Champions League final for Liverpool. Gerrard is given the credit but I think it was Hamann that changed that game. Two more shouts here - Daniel Amokachi, Everton against Tottenham in the FA Cup semi-final in 1995; plus Ben Watson in the 2013 final for Wigan. Get yourself booked in - it's Manchester City v Watford, Saturday 18 May, 17:30 BST. Live on BBC One, of course. Grumble: Anyone who says the FA Cup is no longer important should just take a look at what it meant to those players and fans. What a great game of football! Watford goalkeeper Heurelho Gomes: "It was amazing. Until 70 minutes it looked like Wolves were going to win but this is a proper cup game. Everyone enjoyed that. I believed we could come back, of course. You have to believe. "The boys kept so cool. Troy Deeney can deal with any pressure, once more he did that for us. It was amazing and he deserves it as well. "It's about the group, the team. I will not knock on the manager's door to play in the final. If he needs me I will be there, if not we are well served by Ben Foster." Steve C: Impact sub. Twice in 5 days late in May in 1999. Teddy Sheringham In both FA Cup final and Champions League final Sheringham came on, scored and got an assist. Alistair Bruce-Ball is also asking who can match Gerard Deulofeu for impact from the bench. I'm thinking Palace in 1990 again. After they beat Liverpool 4-3 in the semi, Ian Wright came on in the final to score twice against Manchester United. It ended 3-3 after extra-time, with United winning the replay 1-0. More from Javi Gracia, on substitute Gerard Deulofeu's performance: "Everybody knows he is an amazing player and today it was difficult for me to start with Gerard besides me on the bench, but we knew during the game at that moment he will be very important for us." And on goalkeeper Heurelho Gomes: "I think like the rest of the players without exception, today we have seen some of them but all of them are enjoying this moment. He is an experienced player, a long career and is enjoying this moment like a boy. "I have never been in the same situation, I try to enjoy today because on another day you may be on the other side. "At this moment, I am only thinking we have to come back here and it will be a pleasure playing against City, it will be difficult but we try to enjoy." 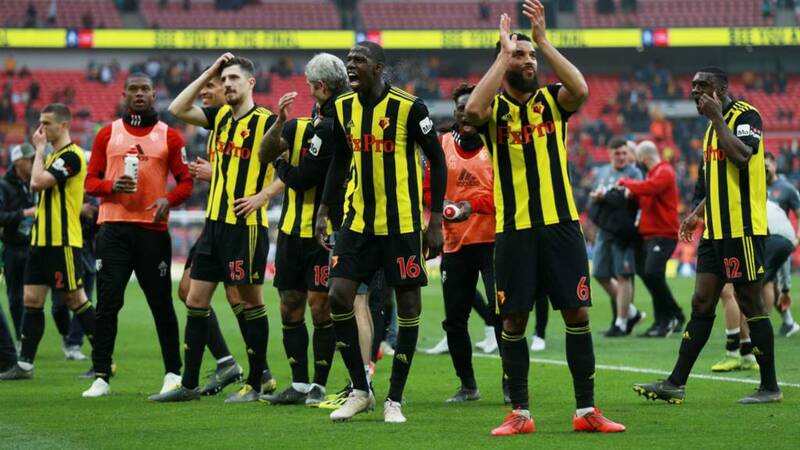 Watford boss Javi Gracia: "It was very tough. We started playing, Woking after Newcastle, after QPR, after Crystal Palace and now after Wolves. Everything was lost - we were able to show our character and at this moment I am very proud of my players. "You always believe you can score one goal because in all the games this season we have always competed until the end, it wasn't different today. "We tried until the end and sometimes it happens if you believe. Today we showed our strength as a squad, our belief. I am very proud." Chris Sutton is refusing to criticise Nuno Espirito Santo for instructing his side to sit back during the closing stages. The ex-Chelsea striker said: "Wolves' strength has been the counter-attack this season and it's worked. Sometimes you've got to hold your hands up and say that was a brilliant goal by Deulofeu and for the penalty, Dendoncker was tiring and got it wrong. "We're not going to be critical of Nuno because it's been an amazing season for Wolves. What he has achieved with a team that came up from the Championship and has shown they can compete at the top end of the Premier League. "I don't really want to hear too much negativity from Wolves fans." Ian Purser: Quick reply to Dominic (18.48) Greatest Cup Semi ever? Some of us remember Palace 4 Liverpool 3 & Man Utd 3 Oldham 3 on the SAME DAY! More from Wolves boss Nuno: "It was a tough game, we knew that. There is sadness, there is pain but we have to look at it. In the final minutes of the game we should do better because the game was ours. More from Wolves boss Nuno Espirito Santo: "We have to stick together. We will keep going. We must prepare well for the next game and keep growing as a team and try to reach a semi-final in the future and win it. "It is tough, sometimes the pain that you feel makes you grow. You have to feel it as a group. We will stick together because it is our identity. It is relentless, we never give up and we will come again. "It is a terrific season. Not only this season, last season we were in the Championship and came to the Premier League. We keep on fighting each game, each challenge we had ahead of us we go and compete. That will not change, ever." Wolves boss Nuno Espirito Santo: "It was an emotional game. We had it, and it got away from us. It was a sad moment, we cannot hide it. Now it is disappointing and sadness. "We did the first half very good, second half not so good. We could not manage the ball. Watford kept going, long balls, and we didn't manage well. "We are disappointed. This is football, we must stand again, we have things to fight for, but I am very proud, tough ties we were able to win and today we played good. I honestly think we should have done better in the last moments of the game." "We've got room to grow"
Watford captain Troy Deeney: "I've said on many occasions that this team has something special. We're not the most talented, we're not all that, but the hard work and desire at 2-0 down - many teams would've called it a day but we kept fighting and kept going and brought the little man on, who produced a bit of magic. "We've got room to grow, there's not a ceiling on us yet a a team. For a club of this size, let's enjoy this moment.